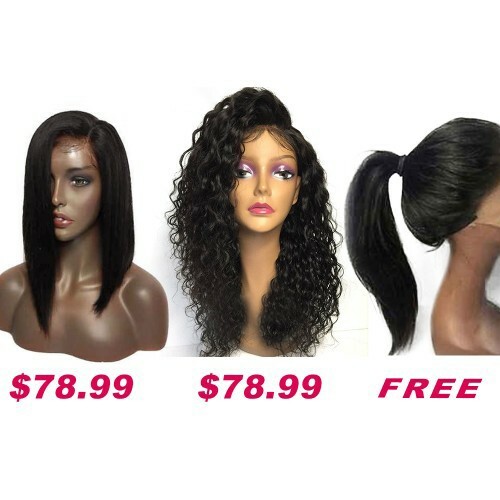 Buy 2 Get 1 Free Curly Wigs Sale On Summer Pack PWSF416 Can Save $42.43 In Total. Good hair for the price and style.. I had a few tangles with the straight but all around good deal. superising! !its sooo soft and have not shed so far. I believe that after you bought it, the most satisfied will be its price!it worth my dollar i pay,i think it can be uesd a long time,i super love this one piont. I realy realy actually like this sets. Tho something isn't as I would like, but overall it is a very nice wig sets especially for the price. You will not image how much it save for me!I will order again for sure!!! OMG!I can't believe this suits series have new outfit at the end! To me it is one of the best I ve had for that price ! !And the free one is equal quality, I still can't believe that's true.Now I have three good quality wigs!HAAA! Just A Price Can Get Three Different Style Hot Sale Wigs,Buy 2 Get 1 Free On Summer Wigs Pack Can Save $42.43 In Total.Time And Quantity Is Limited,Quick Take Them Home.